On May 2, 2008, at 1:33 UTC (5:33 pm ADT) a strong earthquake of magnitude 6.6 occurred in the Andreanof Islands region of the Aleutian Islands. The event was situated about 64 km (40 miles) W of Adak and 238 km (149 miles) E of Amchitka. We recorded nearly 1,500 aftershocks through the end of May. The largest aftershock was magnitude 5.0 and occurred on May 8 at 14:12 UTC. On April 15 and 16, magnitude 6.4 and 6.6 earthquakes, respectively, occurred about 110 km (69 miles) to the west of the May 2 event. The mainshock was felt strongly on Adak. No reports of damage were received. 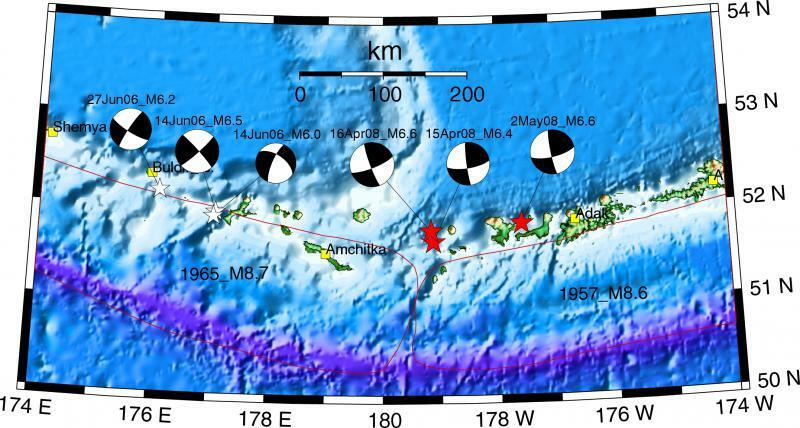 The strongest known earthquakes in this region are the 1965 M8.7 Rat Islands earthquake to the west and the 1957 M8.6 Andreanof Islands earthquake to the east (approximate extent of the rupture zones is shown in red). In the last five years, eighteen M6-7 and three M7+ earthquake occurred within the area shown on the above map. Most of these events occurred on the plate interface between the subducting Pacific and overriding North American plates. The April and May, 2008 M6+ events are of a different origin than the above mentioned underthrusting events. Faulting parameters estimated from the waveform inversion indicate strike-slip type of motion for the mainshocks. Their locations, shallow, and above the down-dip end of the locked interface, are consistent with the events occurring within the crust of overriding North American plate. In June 2006, similar sequence of earthquakes occurred about 300 km to the west of the May 2008 events. In western Aleutians, the crust is partitioned into rotating blocks, such as Buldir and Near blocks. In addition in this region, direction of convergence between the two tectonic plates is oblique to the plate interface. The 2008 and 2006 strike-slip events could indicate relative motions of the crustal blocks or slip partitioning between the plate subduction and strike-slip faults in the region.